Economics of the consumer electronics industry in India | Globonomics! 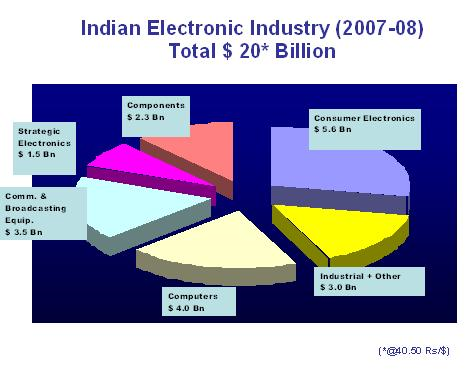 The consumer electronics industry in India is a $ 6 billion industry or Rs. 22000 crores and catering to the needs and wants of a population of over 100 crore people. This is growing at a rate of 10-12% every year. Today, the Broadband Internet has become ubiquitous in the middle class household with a desktop computer. Government players are competing with their private counterparts with aggression and passion – something never seen before. A case in point would be discussed shortly. Notebooks and laptop computers are synonymous with the traveling professional and the business professional – this is across the SMB segment or the large enterprise segment. White good manufacturers never had it so appealing to their sales and bottom line figures. The AC industry is poised to grow at over 35% every year! Washing machines, AC’s, refrigerators, microwave’s – the list goes on. Pictures are going digital. Children are spending more time in front of their home LCD sets and playstations than they should be outside playing outdoor games. Plasma/LED TV’s are no longer out of reach. So, how and when did this metamorphosis occur and what are it’s ramifications for the gadget industry in India? First of all, market sizing apart, it is to be remembered that micro economics dictates that there are two types of goods – luxury and necessity goods. With increased disposable incomes of the largest segment of the Indian pyramid i.e. the middle class, the affordability is no longer out of range. Most of these are upward compatible. They aspire to have a larger TV, a larger fridge, a fully featured cellphone, a better music system and the likes. With a young working class population and unique demographics, this growth is bound to continue. The American, Japanese and European population is ageing; fast. They have other bigger problems to contend with – healthcare, pension, retiring benefits etc. So, there is more money flowing out of their social security coffers (if I may call it that) than compared to a country, say India. We can learn from their mistakes and spruce up our healthcare and insurance industry now; when it is still tightly regulated. IRDA does not permit any insurance player to engage in FDI from foreign players of over 26%. Such artificial curbing while encouraging domestic players to operate is not indicative of a free market system. Yes, there are pitfalls in a free market economy such as the USA where toxic derivative instruments and the greed of a select few Wall Street Investment bankers has brought us to this current state of affairs in the world economy but that should not deter India from adopting better freely operating but regulated markets – whether it is banking, insurance or Telecom. 3G auctions have been delayed from 2008 and now the latest date is 2011! Devices armed with 3G are awash in the marketplace but the industry does not support it. Isn’t this unproductive? After all, economics 101 dictates that supply and demand characteristics are critical. I recently had to take my BlackBerry trackball for repairs and it was out of warranty. The engineer told me RIM will charge Rs. 6K to clean it! Isn’t that ludicrous? They set the price because there is not a big enough market for such services. If I went to a Nokia dealer with a similar problem on say, a Nokia phone, he would have probably have charged Rs. 100 to clean it. This gives you some idea on how pricing is. Apple’s iPhone’s were a marketing disaster in India. It’s not that there is no demand for iPhones in India. It’s just that Apple/AirTel did not get it’s marketing communication/strategy right in August 2008. First, they priced it forbiddingly expensive and a couple of gadget crazy chaps like me went and bought it at such a high price point. Then, they did not do what AT&T did in USA – subsidize the cost of the base handset. Then, they did not have a trained sales team. I experienced all this myself as a consumer. Look at Sony. They sell LCD TV’s and incur a loss on every one of those sold. However, the common electronics showroom sales chap knows all about your Sony LCD and will advise you which one has what benefits. This is the importance of keeping a trained sales force. LG and Samsung have invaded the Indian market. No, these are not Japanese or American players. They come from South Korea. Look at their brand identity in India in the typical middle class household. It’s mindshare is huge! If you come to the Telecom market, BSNL is really doing a good job in after sales service – I have experienced this myself many times when I have been to BSNL to work on my broadband router or my connection. They have to. After all, they are competing with the likes of AirTel, VodaFone and a host of new entrants. Yes, barrier to entry to this industry is high – with high fixed costs but still this industry has become a competitive Oligopoly. Overall, the consumer electronics industry is a competitive Oligopoly, has great growth potential and a lot of consumer electronics retailers would be laughing all the way to the bank in the coming years if they get their marketing strategy right. That is really the key since there is a huge demand lying untapped out there and room for enough players.